More than 500 people were killed and over 1.8 million people were displaced in Chennai floods last year. It was also one of the costliest natural disasters in 2015. The city received 1,200 mm of rainfall in November 2015, highest in the past 100 years. But what made floods more devastating is the inaction at the government’s end. According to a Down To Earth report, losses due to floods could have been greatly reduced if the state government had ensured flood preparedness and curbed unplanned urbanisation that destroyed marshlands and river channels—natural flood sinks in a city. The Parliamentary Standing Committee on Home Affairs stated in its report that "encroachment of lakes and river beds and faulty town planning are major causes for the havoc". The committee's 31-page report, which was based on inputs from the Water Resources ministry, the Ministry of Urban Development and the Ministry of Home Affairs, challenged state government’s claim that unprecedented rains was the only reason behind the floods. Demanding strict action against illegal encroachments, it asked the government to check real estate mafia involved in illegal construction and usurping of water bodies. Blaming encroachments for reducing the carrying capacity of the lakes in Chennai and adjoining districts, the report stated that it also reduced the already low carrying capacity of Cooum, Adyar and Kosasthalayar rivers. When Chennai Metropolitan Water Supply and Sewerage Board released water from overflowing reservoirs, it was discharged into the Kosasthalayar, Adyar and other riverine systems that overflowed their respective banks on either side. The committee has directed the government to clear flood channels and riverbeds where illegal buildings stand. Though the government has vowed to remove 11 unauthorised constructions, the committee observed that the measure will hardly be adequate. 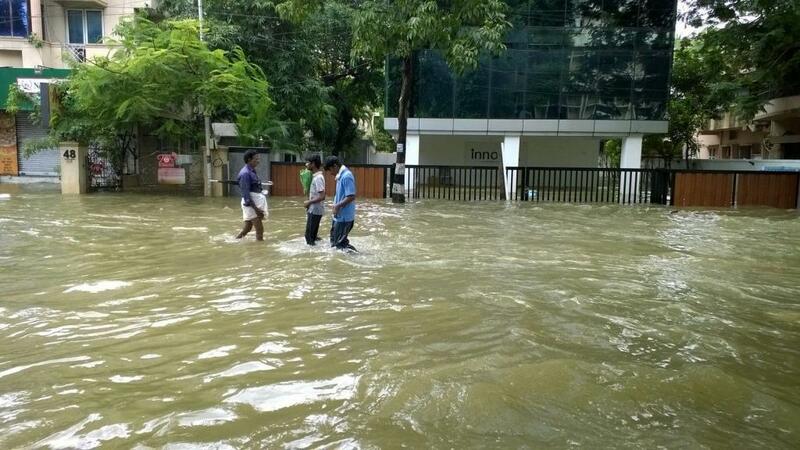 The report held the Chennai Metropolitan Development Authority and Chennai Municipal Corporation responsible for making no assessment of the floods. Since these agencies are responsible for monitoring encroachments in the city, the committee noted negligence on their part. Emphasising the need for regular maintenance of the drainage system, the committee observed that the drainage system across the city needs desilting. The report demanded creation of a calamity map of important cities by developing ‘standard vulnerability indices’ in order to minimise loss of life and property. Tamil Nadu government report had revealed that 41 out of 117 encroachments over a length of 500 metres across the Vayalur River in Kancheepuram District were removed. Although 4046 houses in the banks of the Adyar River were identified as encroachments, no action had been taken yet. The committee report’s observations are a vindication of what Delhi-based non-profit Centre for Science and Environment had recommended a year back. In 2015, the CSE had argued that Chennai floods was a man-made disaster by stating that urbanisation in the city increased by almost 20 times in just four decades. It had recommended a detailed mapping of water bodies, natural drainage and flood-prone areas in cities using remote sensing. It had proposed to integrate the drainage system of the city, including rivers, rivulets, ponds, lakes and other natural drainage systems. The CSE had also recommended better sewage management in Chennai to help fight floods. With Chennai less than three months away from the monsoon rains, it has to take up the risk mitigation activities on a war footing. The same report and findings hold good in the earlier floods in Nellore and other Districts in AP. No remedial measures yet. We wake up only when another natural calamity occurs. Similar observations were made by me in writing to National Disaster Committee meeting held in Hyderabad few years back. M. Shashidhar Reddy was the vice chairmen of the committee with IIT Mumbai prof as technical advisor, wherein he put thrust more on global warming. In November 2015 PM at Man Ki Bath same way attributed the floods to global warming with reference Chennai floods. I submitted my counter to him. This was published in "merinews" 30th November 2015 with the title "Tamil Nadu's floods not due to global warmin: Noted environmentalist disagree with PM Modi". Similarly reports were published on Srinagar and Uttarkhand floods and Hyderabad 2000 floods. Here the basic problem is the ruling class is more interested in real estate and thus master plans were designed in that direction only.